Back in the 1950s, the future Nobel laureate came up the idea that the standard deviation of returns from an investment (a statistical measure used to denote volatility – beta is the equivalent measure relative to a market or index) was a good proxy for its riskiness. It helped that it made the maths neat on his model for selecting an efficient portfolio. Now lots of people look at the variability of historical returns to decide how much risk they would be taking on with a given set of assets. The more the price of something jumps around, the more “risk” that you are taking on. The less it jumps around, the less you need to worry about it. But this about as true as the Efficient Market Hypothesis (EMH). Which is to say, it just isn’t true. But they don’t, and it isn’t, and it doesn’t. That one hasn’t turned out to be true either – low volatility stocks have outperformed in recent decades. To expand on the third point, individual asset returns are combined into portfolios using correlations. These correlations are unstable and tend to increase during periods of stress, increasing true risk. To elaborate on the final two points, junky assets will probably do well for a time (during the bubble phase) before they blow up. This does not mean that they are not risky at the moment before the bubble pops. If the variability of historic returns is not the risk that we are looking for, what should we put in its place instead? To answer this question we need to go back to the beginning. What is the purpose of investment? What is the purpose of investment? Savings are consumption deferred into the future, and the purpose of investing is to protect and grow that purchasing power. So the risk we face is the chance that our purchasing power will be lost. Depending on the assets we hold, the detailed mechanism by which purchasing power shrinks will vary. Key amongst the threats – and this seems strange to say in today’s economic climate of negative interest rates and deflation – is inflation. That is why cash, which delivers low but stable returns, is amongst the riskiest assets for the long-term investor since it rarely keeps pace with inflation. Short-term investors need to worry about volatility, but long-term investors do not. And we are all long-term investors, whether we realise it or not. If you have a short-term (5 years or less) need for funds, keep some cash on hand. You don’t want to be a forced seller in a bad market. But if you don’t have a short-term need, then don’t worry about volatility. What we need to do as investors is to understand the range of possible outcomes for the assets we own, and put together a portfolio to offset the real risks they each face. How we do this will depend on our investing style – a momentum trader won’t approach the problem in the same was a deep value investor. But company and country fundamentals, industry and sector disruption, fiscal and monetary policy, and global macroeconomics will be involved. If volatility is so wide of the mark in assessing risk, why is it so popular? As well as Harry, we can blame the professionals. The investment industry is not currently set up for high performance. Investment managers need to market their services, and it’s easier to do this with a common measure of “risk” that to go to all the trouble of modelling future returns. As we said earlier, the standard deviation of historic price variability makes the maths easy. Quarterly reporting of (price) performance also favours the smoother path against the superior destination. But you don’t operate under the same restrictions as the professionals. 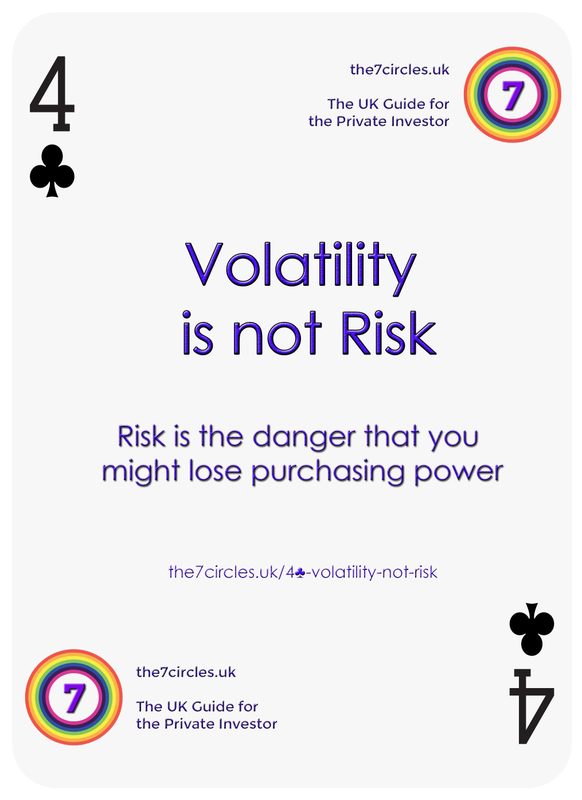 So remember, Volatility is not Risk – Risk is the danger that you might lose purchasing power. You need a budget - to make sure that you spend less money than you have.